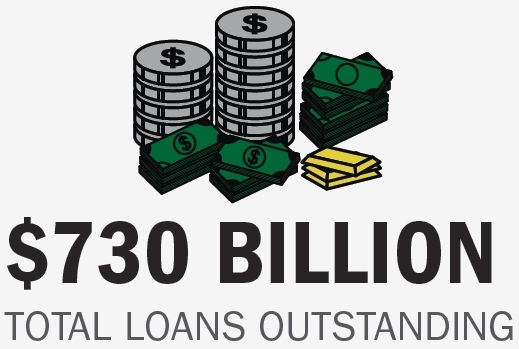 A break down of the industry’s financial performance and impact in 1Q 2015.
Credit unions originated $89.2 billion in loans in the first quarter of 2015. 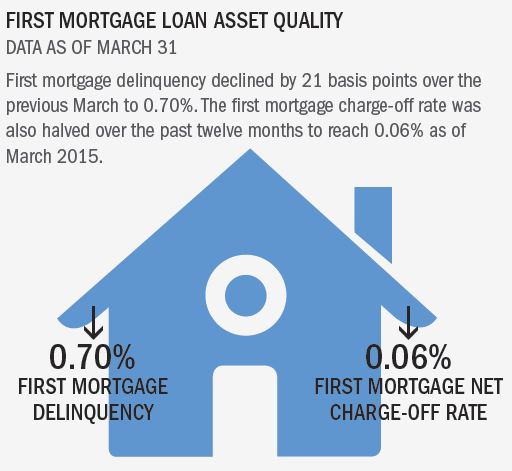 This 20.5% year-over-year increase set an all-time record for the first quarter. 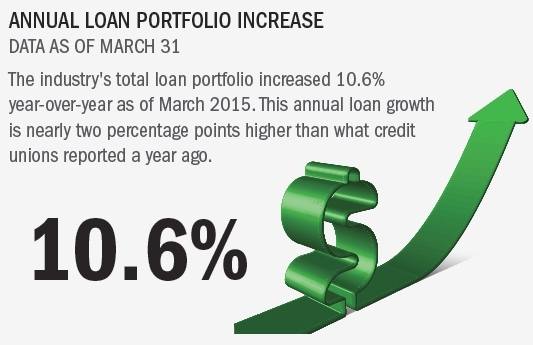 Consumer lending drove some of these gains, rising 11.8% year-over-year. 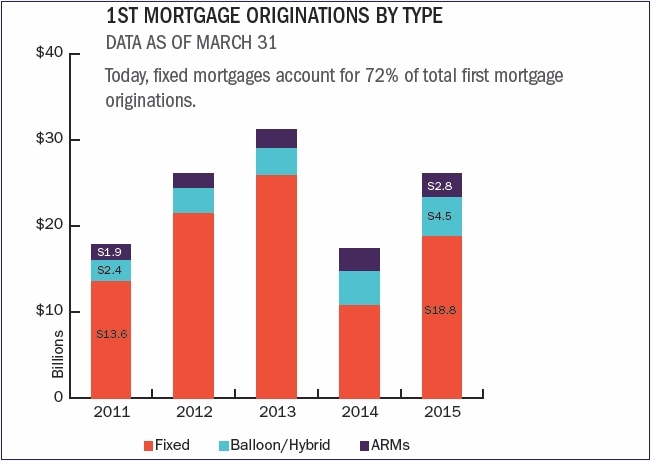 But first mortgage originations roared even further ahead, increasing 49.6% from the same period a year ago. 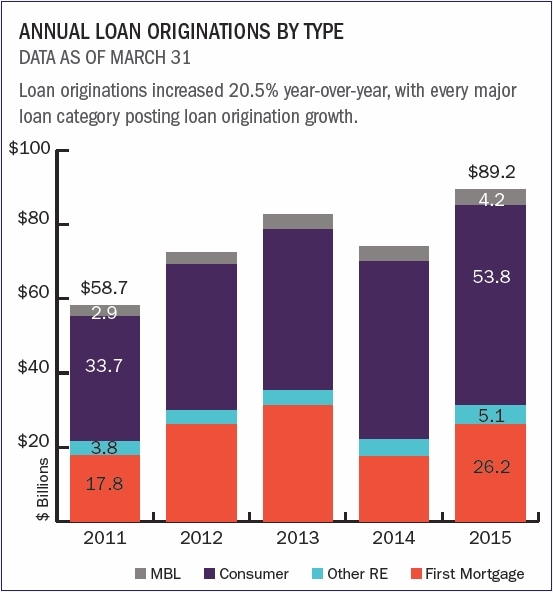 With this growth in originations, outstanding loan growth was nearly 2.5 times the rate of share growth at 10.6% versus 4.4%. In many markets, this trend helped further ease any remaining liquidity concerns left over from the post-recession consumer spending slowdown. 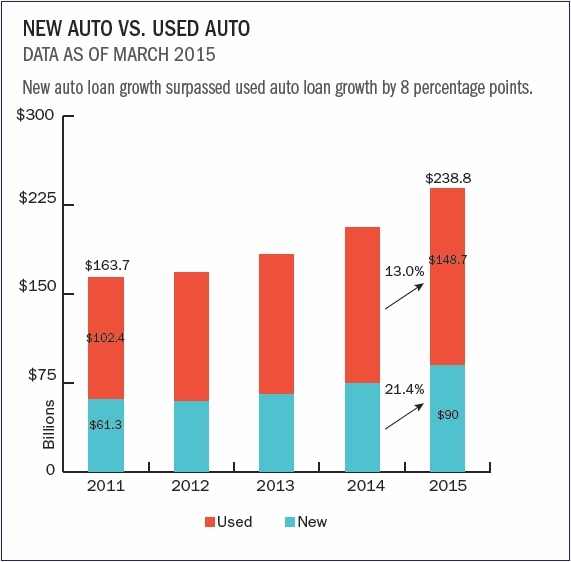 As of March 2015, the overall auto loan portfolio grew 16.1% year-over-year to nearly $239 billion, marking five consecutive quarters in which auto loans have posted double-digit growth. 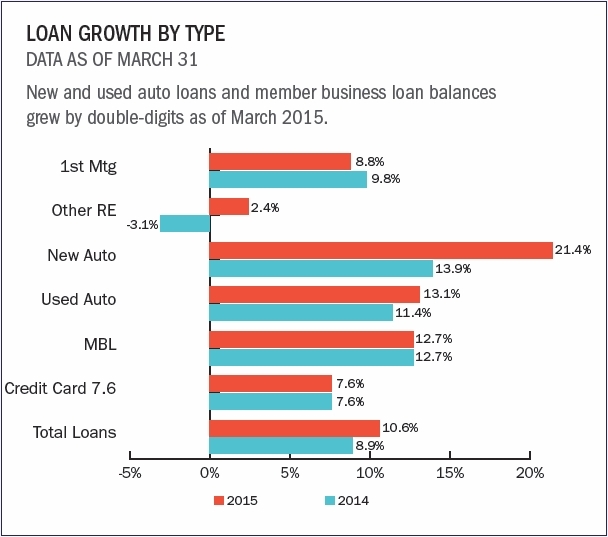 Among all loan categories this quarter, new auto loans had the largest percentage increase compared to the previous March, rising 21.4% to $90.0 billion. 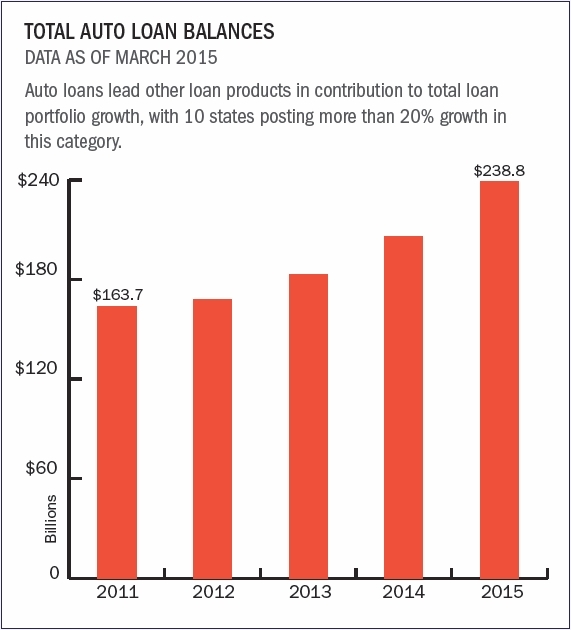 As the second largest component of the industry’s loan portfolio after first mortgagees, used auto loans also grew 13.1% year-over-year to reach $148.7 billion. 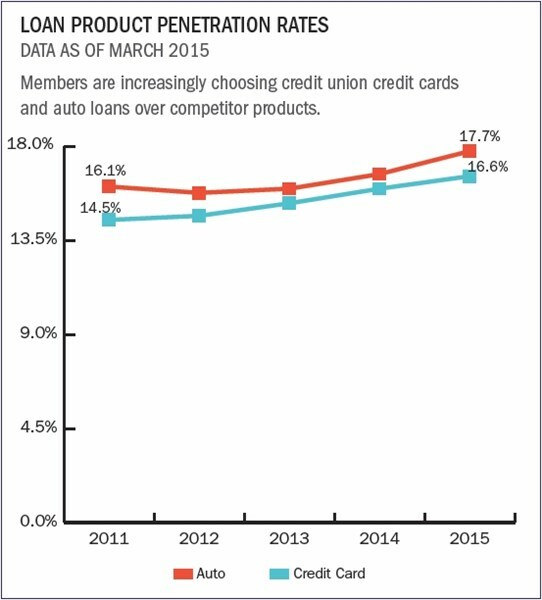 Credit unions are more than holding their own against banks and other captive auto finance companies, with some relying on competitive rates to stake out a larger claim. 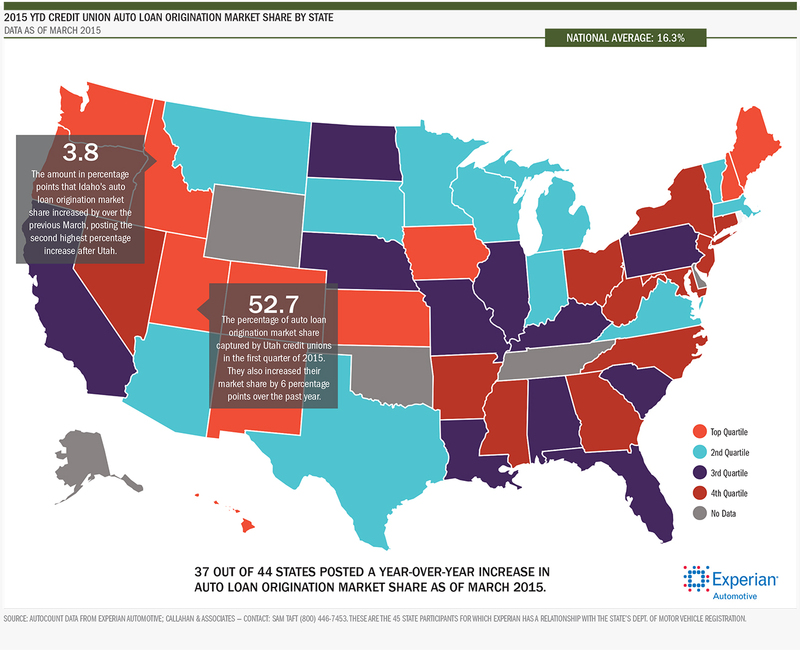 According to AutoCount data from Experian Automotive, the industry’s year-to-date market share for auto originations grew to 16.3% in the first quarter of 2015, up from 15.3% one year ago. 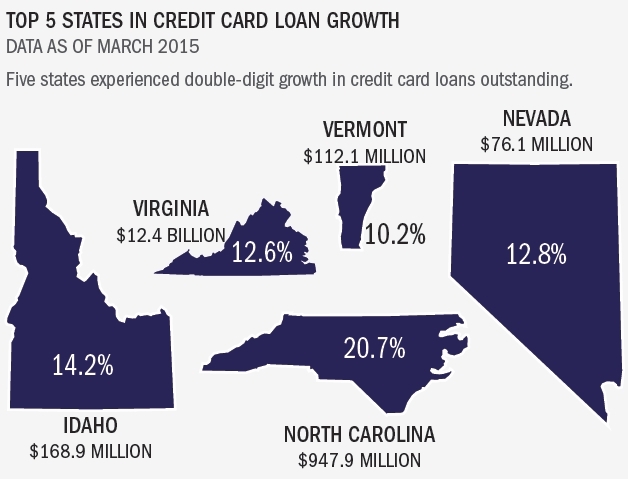 Credit unions originated $26.2 billion in mortgages in the first quarter of 2015 alone. Fixed rate mortgages were the most popular product for that period, accounting for 71.9% of total first mortgage originations. That’s higher than the 61.5% seen in 1Q 2014, but still below the recent high of 83.2% set in 1Q 2013. Conversely, adjustable rate and balloon/hybrid mortgages accounted for 28.1% of total first mortgage originations during the first quarter, down from last March when they comprised 38.5%. 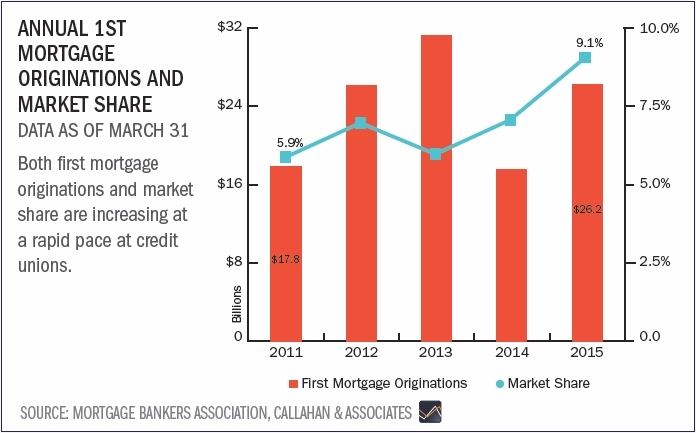 Due to the industry’s resounding success with fixed rate firsts and a favorable rate environment, overall credit union mortgage origination activity boomed in the first quarter, growing 49.6% from the $17.5 billion originated in the first three months of 2014. There were also key gains made in homebuyer awareness this year. In total, the cooperative industry accounted for 9.1% of all U.S. mortgage originations, according to the Mortgage Bankers Association. This is a notable improvement from the 7.1% market share captured in the first quarter of 2014. In addition, although credit unions held roughly the same amount of mortgages on their balance sheets as in previous years, sales to the secondary market increased from 32.4% in March 2014 to 38.6% this year. 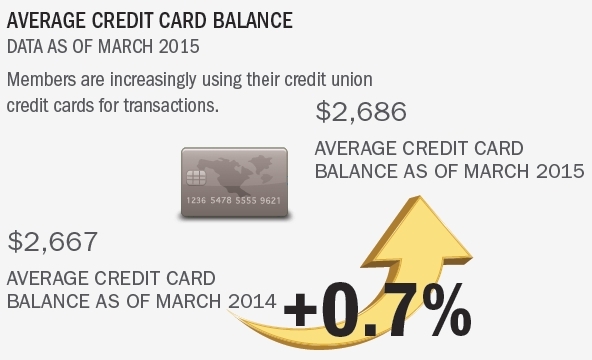 Credit unions reported a robust 7.6% annual growth in credit cards as of March 2015. 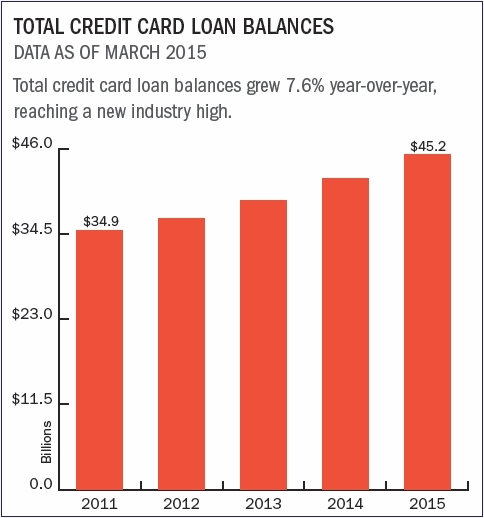 Total balances outstanding reached $45.2 billion and the average balance per card grew 0.7% year-over-year, compared to a just 38 basis point increase the previous March ($2,686 versus $2,667). 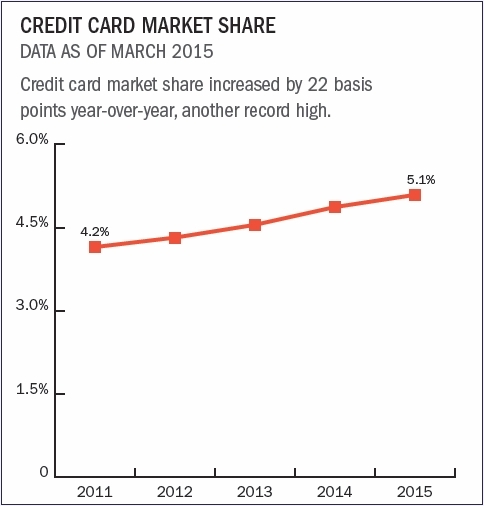 The percentage of members with a credit union credit card increased 55 basis points over the past twelve months to reach 16.6% at the end of the first quarter 2015. Credit card market share also increased, from 4.87% in March 2014 to 5.09% in March 2015. 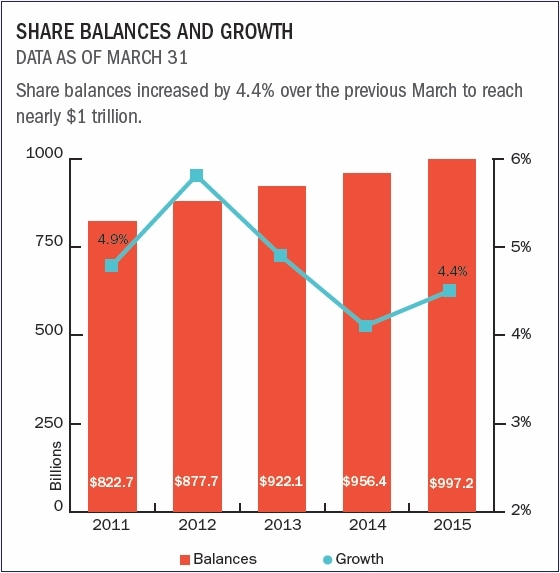 Members added $41.7 billion in share balances over the past twelve months to top $997.2 billion as of March, representing a 4.4% year-over-year growth. 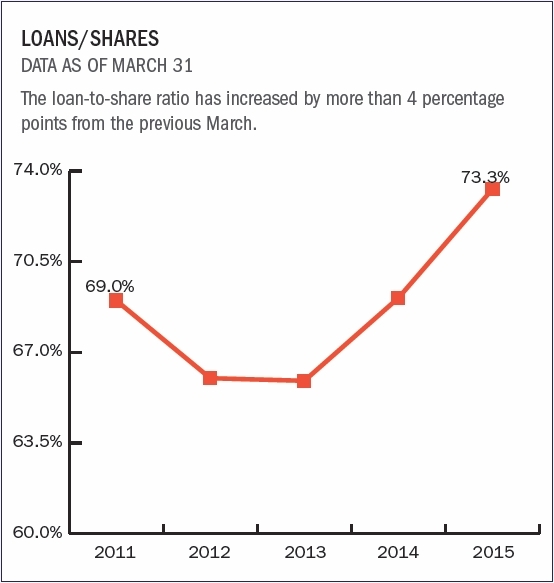 Although this metric was stable in the first quarter of 2015, the spread between loan growth and share growth is widening as loan growth continues to accelerate. Since the third quarter of 2013, the annual net liquidity change (annual share growth minus annual loan growth) has been negative. Core deposit categories made up most of the growth in this area. Share draft balances were the fastest growing, up 8.2% over the same period to reach nearly $141.8 billion while regular shares posted the second largest increase over the past year, growing by 8.1% to reach $360 billion. 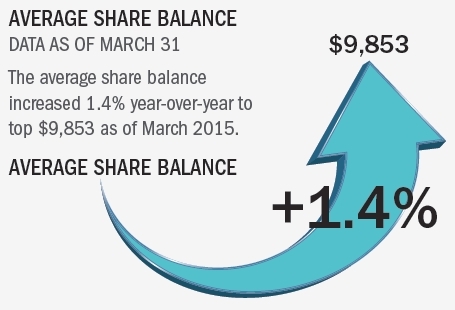 Even money market balances increased by 3.4% since last March to reach $227.5 billion. Longer-term savings options have remained relatively unpopular, as members are still hesitant to lock up their funds in a low interest rate environment. 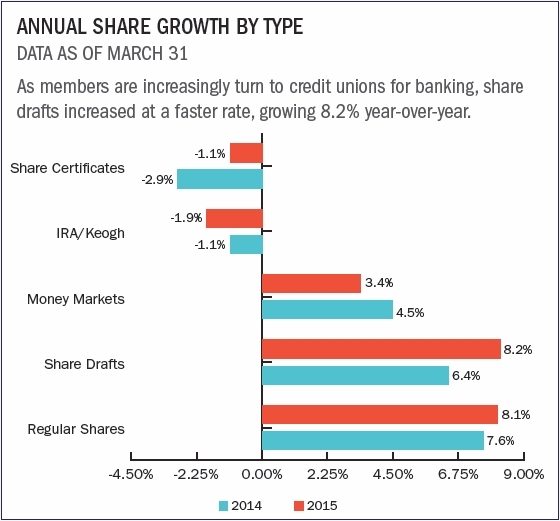 As a result, IRA/Keogh balances are down 1.9% from last March, while share certificate balances have also declined 1.1% over the same period. 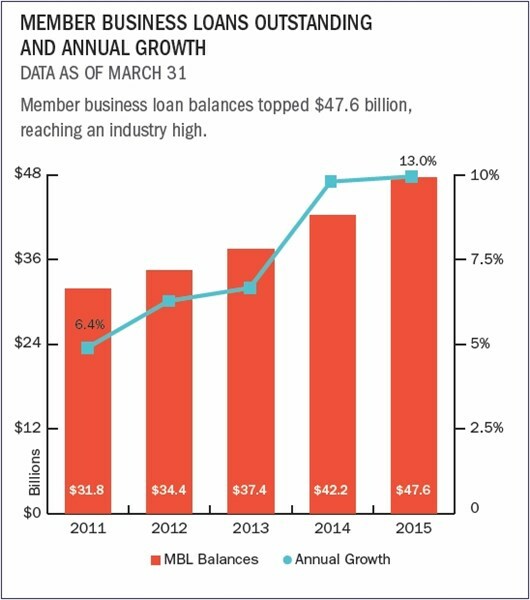 Although they represent just 6.5% of the industry’s loan portfolio, member business loans are becoming an increasingly important part of some credit unions’ suite of products. 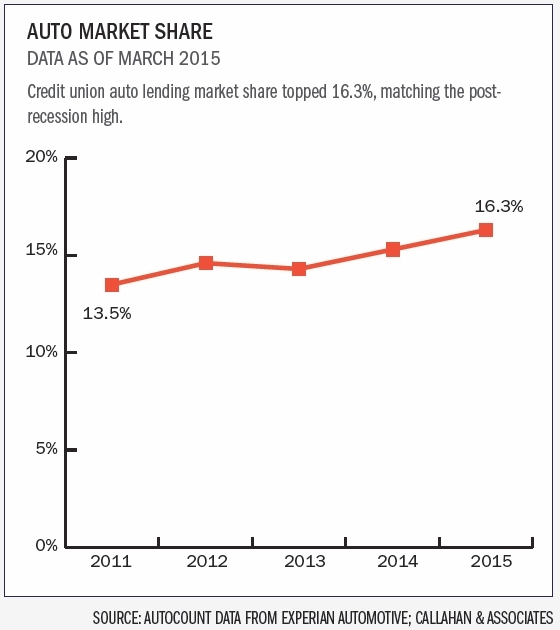 Throughout the industry, 33.8% of credit unions now offer business loans, up from 32.6% last year. As of March 31, these cooperatives reported outstanding business loan balances of $47.6 billion, an increase of 13.0% from a year ago. 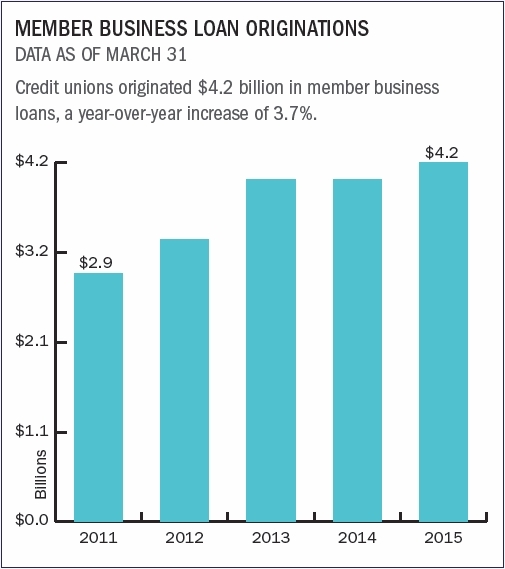 Over the same period, credit unions originated $4.2 billion in member business loans, up 3.7% from March 2014. 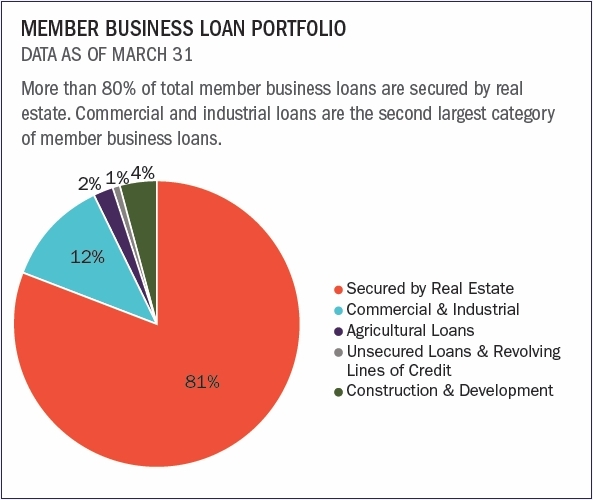 In total, 81% of the member business loan portfolio was secured by real estate, with the second largest portion of the portfolio comprised by commercial and industrial loans at 13%. 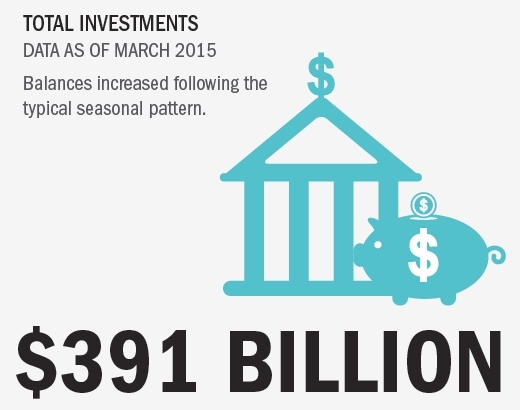 The credit union industry held more than $391 billion in investments as of March 2015. Total investment balances increased by $24.5 billion from the previous quarter’s $366 billion and the seasonal pattern of increased investments in the first quarter continues hold true as members deposit their tax refunds and bonus payments. 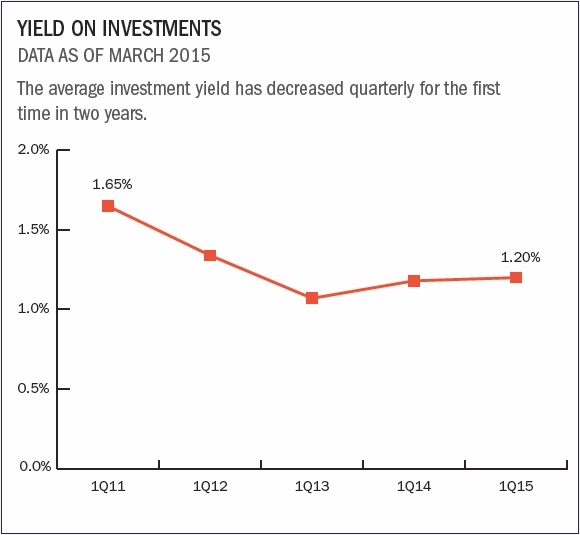 For the first time in two years, the average yield on investments has decreased from the previous quarter. Increased cash positions and higher coupon securities maturing have led to a 4 basis point decrease from 1.24% to 1.20% as of March 2015. 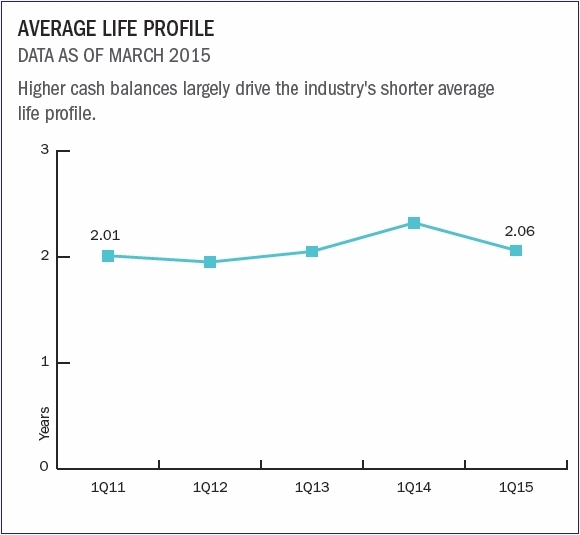 Thanks to the decline in the overall yield of the portfolio and larger cash balances, the average life of all investments (including cash) fell from 2.21 years in the fourth quarter of 2014 to 2.06 years in the first quarter of 2015. 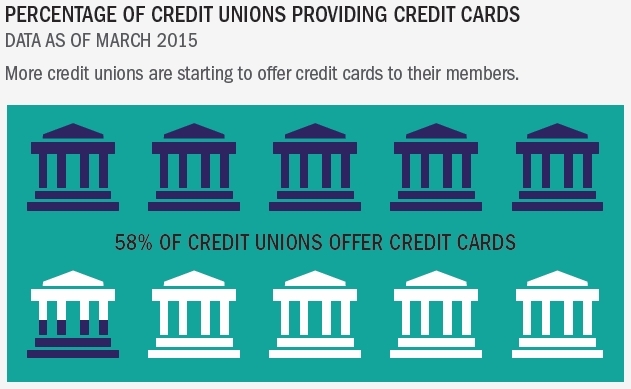 As of March 2015, credit union membership reached 101.2 million, growing 2.9% from the previous March. 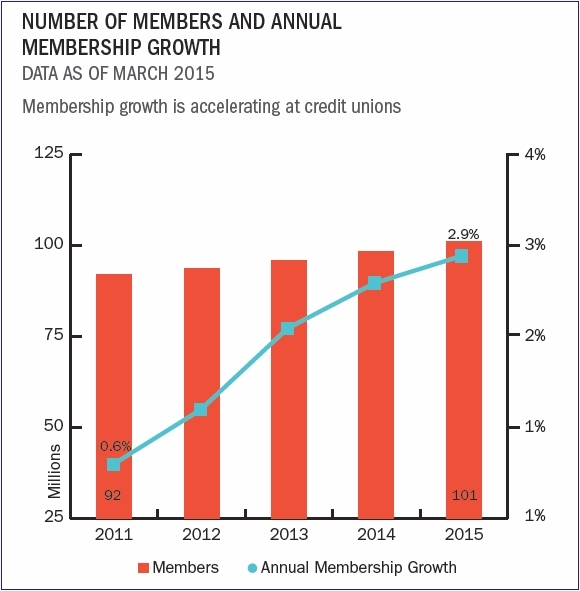 This marks the highest annual membership growth rate since 2010. 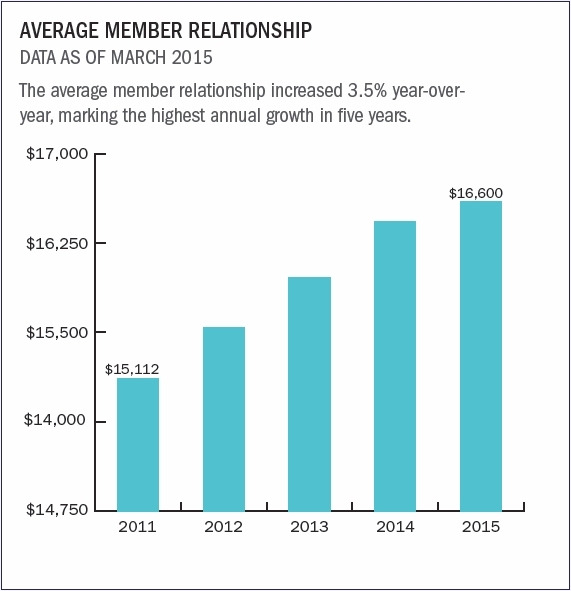 Despite this robust growth, the average member relationship more than kept pace here, growing 3.5% year-over-year to top $16,600 as of March 2015. Loan product penetration rates for credit cards and autos both increased year-over-year but credit card penetration in particular saw a significant change, increasing 55 basis points over the previous March to reach 16.6%. As of first quarter 2015, more than 54% of all credit union members have a checking account at their credit union, up from 52.7% in 2014. Home Is Where The Heart Is, And The Money Too. 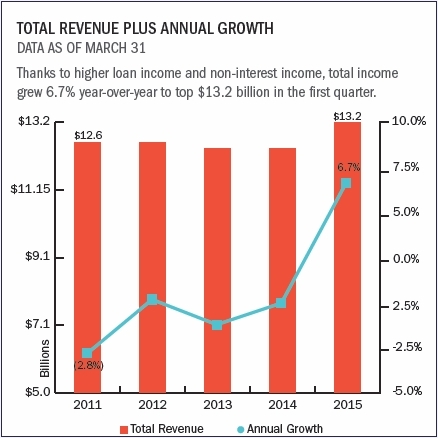 Underpinned by growth in loan, fee, and other operating income, total income increased 6.7% annually to top $13.2 billion in the first quarter of 2015. Total interest income increased 5.4% annually, driven by strong loan growth which helped to offset a 3.5% annual decline in investment income. 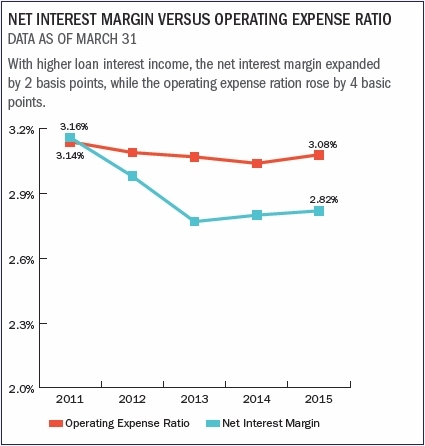 Loan interest income reached $8.5 billion in March 2015, an annual increase of 6.8%, causing the net interest margin to expand by two basis points. 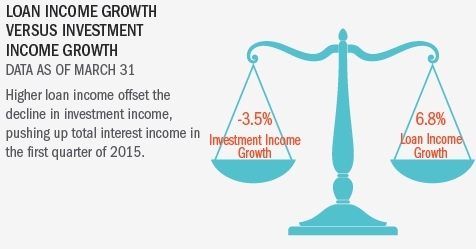 Investment income fell to $1.1 billion for the quarter, largely due to the persistent low-rate environment. Meanwhile, total non-interest income rose 10.2% compared to the year prior, with other operating income surging ahead by 18.9% and fee income growing 2.0%. Other operating income did benefit significantly from sales of mortgages to the secondary market. 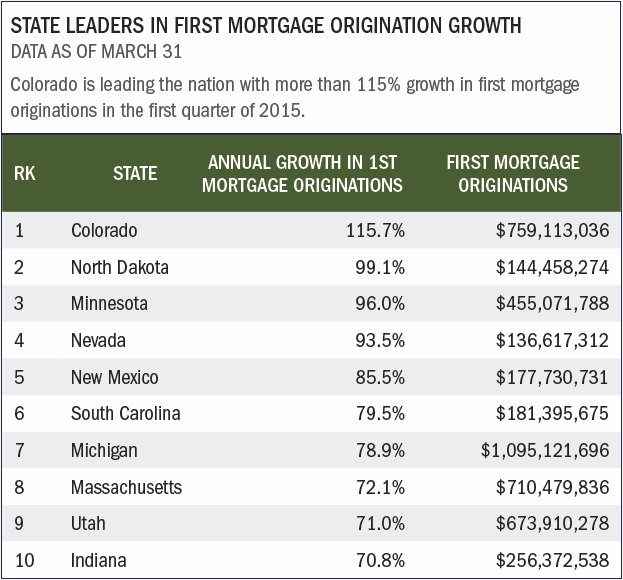 Credit unions sold $10.1 billion in first mortgages in the first quarter of 2015; that’s an increase of 78.5% from one year ago. 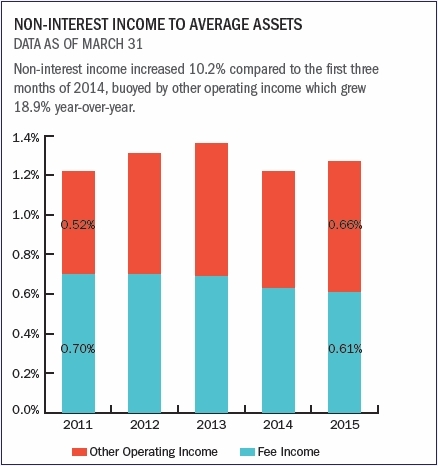 Return on assets was 0.78% through March 2015, two basis points below first quarter 2014 results. As asset growth increased following elevated lending activity, this depressed the effect of a strong 5.8% annual growth in net income, decreasing ROA. 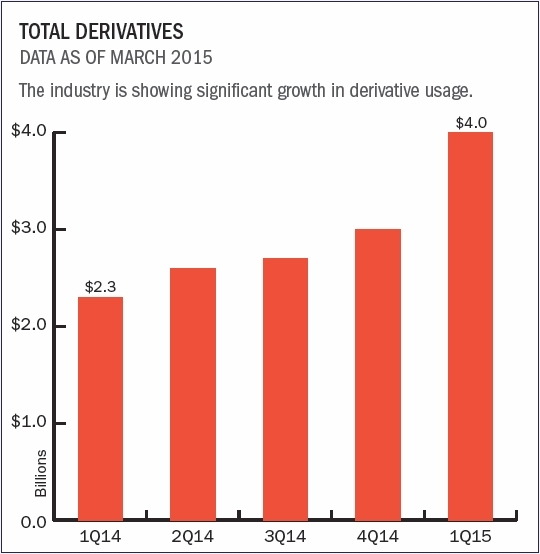 However, even with this lower figure, the industry’s net worth ratio still increased by 20 basis points to 10.8%. 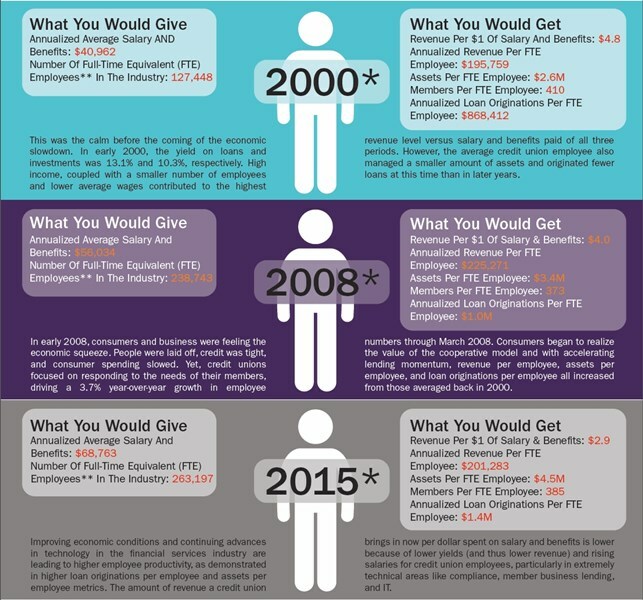 Callahan data provides a detailed look at the evolution of cooperative workspace over the last 15 years.